If you need to locate your Yazoo/Kees model number and serial number, we can help! Find your Yazoo/Kees equipment below to see model and serial number locations. Yazoo/Kees power equipment will have three identification numbers including, a machine type designation (I.D. ), a manufacturer type number (model number), and a serial number. These numbers will be found in various locations on your Yazoo/Kees power equipment. The model and serial number plate on a Yazoo/Kees zero turn is located on the left side of the engine compartment. 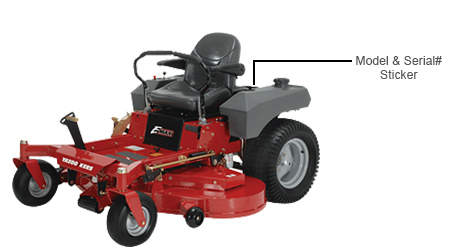 Find your Yazoo/Kees Commercial Mower Parts.